FIX Hyper-pigmentation & Skin Tone! Prevents and minimizes formation of brown spots. 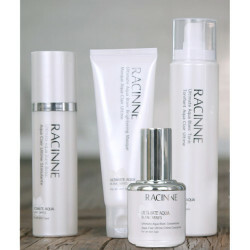 Racinne is loved by Asian skin as it helps to lighten up and even out your skin. Not only does it use the revolutionary “Callus Cultivation Extract Technology” of Lotus that contains anti-inflammatory properties and melanin inhibition, but it also contains 8 other different precious brightening & moisturizing extracts including Niacinamide, Nelumbo Nucifera Flower Extract, Ever Cellwhite, Royal Jelly Extract, Pearl Extract, Aloe Barbadensis Leaf Extract, Moist Keep 24, and Cucumber Extract. Apply morning and evening after cleansing and before your moisturizer.